Tagline - a simple line that is usually displayed under the blog title. Time Format - you can use this field to customize your time format, for example: H:i. Theme - Default / Theme 1-6 - Choose one of the 7 themes available for the Blog View. Starting with ver. 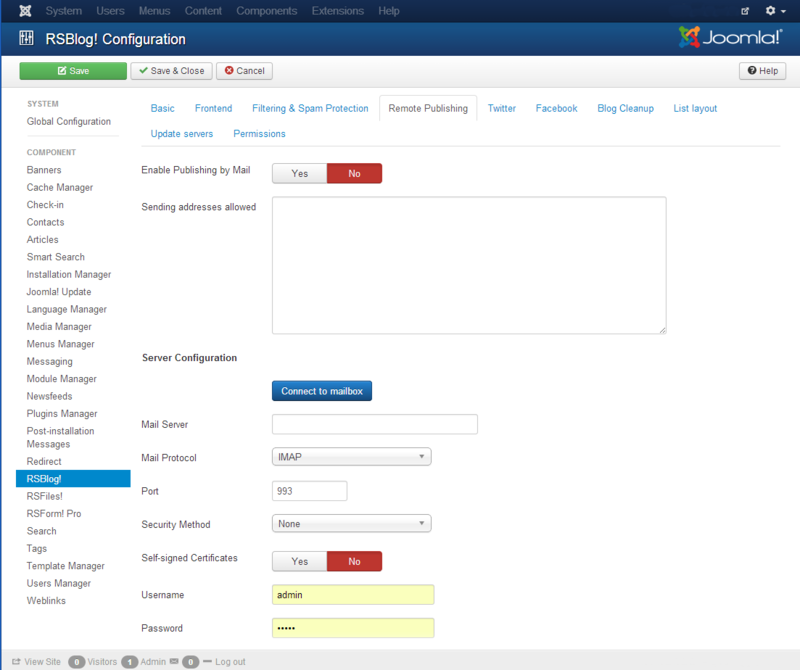 1.12.0, the old themes that were available for Joomla! 2.5 have been removed, being replaced with the ones mentioned above. If you, however, still wish to use those instead, you can do so by installing the RSBlog! Legacy Plugin. 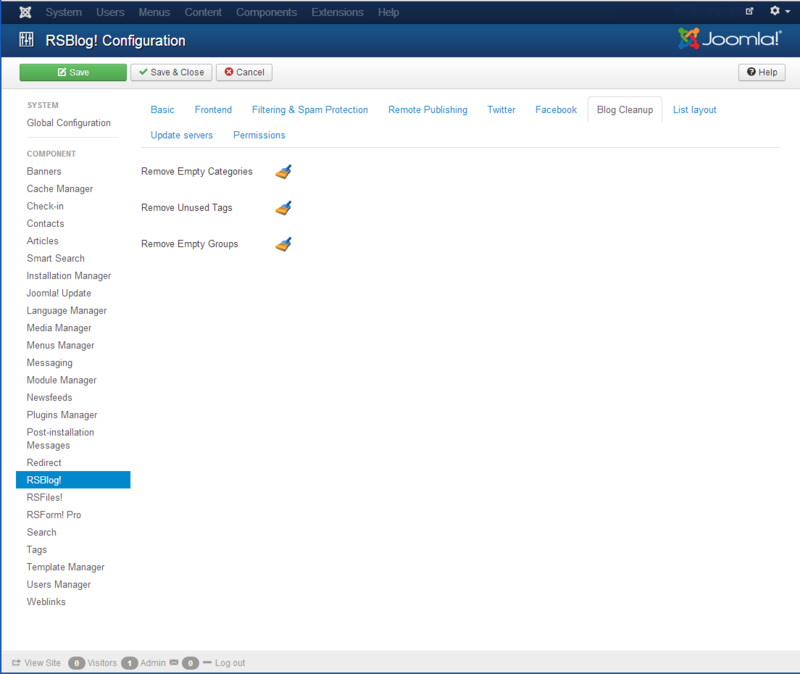 Enabling this plugin will cause the Theme setting present here to no longer apply. New in Version 1.12.18 a new theme is available Timeline, this will help you display your blog posts in a vertical, scrollable timeline format. 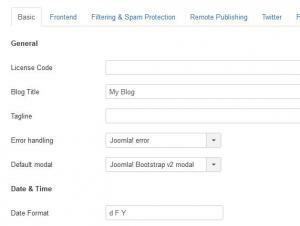 Enable Boostrap - Yes / No - set to Yes if your template does not include Bootstrap. Auto-draft save interval - set the number of seconds after which a draft will be saved automatically. Check Interval (minutes) - works in conjunction with the Auto-Archive Posts feature explained above. 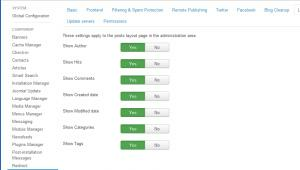 Set an interval, in minutes, after which posts are re-checked for automatic archiving. Setting a small value will result in high resource consumption and will slow down your website. 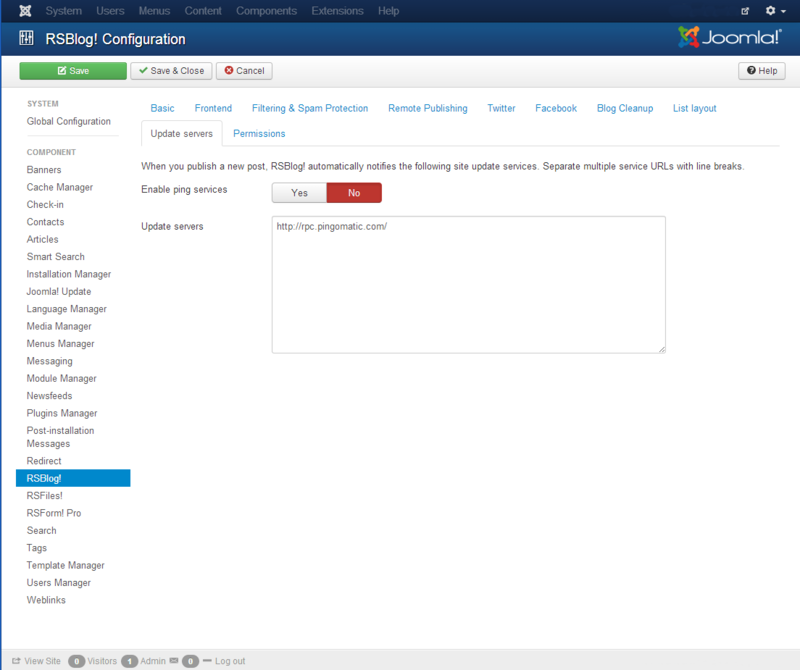 Allowed extensions - you can set the allowed extensions that can be uploaded in the attachment section of the blog post. Separate multiple extensions by using comma. 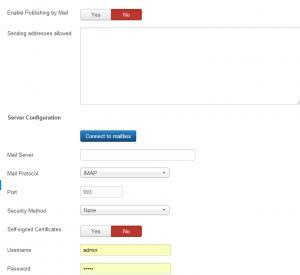 Require consent - set this to Yes in order to require consent from users on form submission. Author thumbnail width - Set the author's thumbnail width, in pixels. Google Publisher Profile URL - provide the link to your Google Publisher profile. Recent Comments - the number of recent comments that will be displayed in the dashboard. 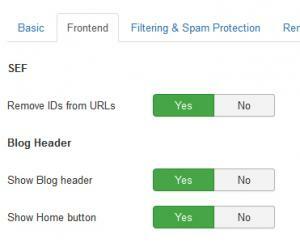 Remove IDs from URLs - Yes/No; - Remove the IDs from the URLs of this component. Show Blog header - Yes/No; - Displays/Hides the Blog header section. 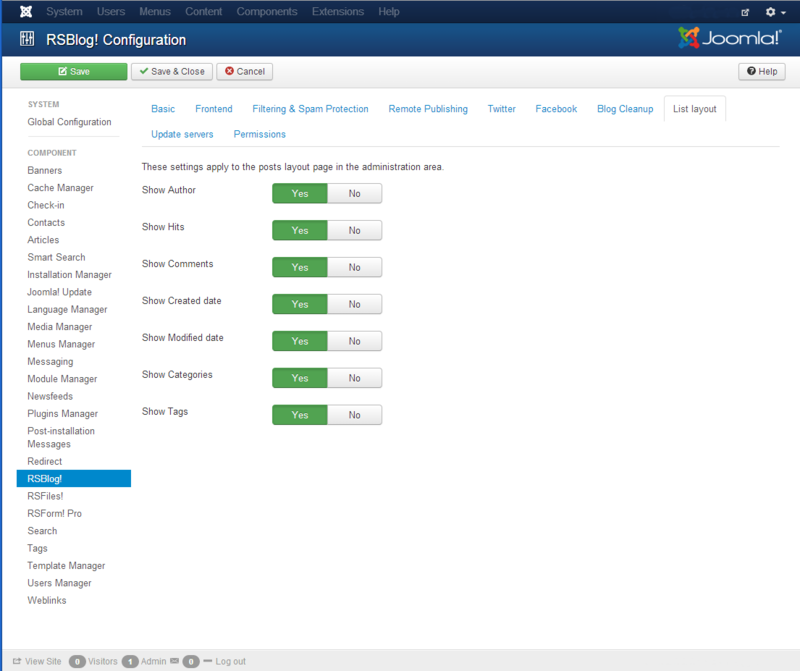 Show Home button - Yes/No; - Displays/Hides the homepage button from the heading box of the blog. Blog navigation position - Off / Up / Down / Up and Down. If enabled some navigation buttons will appear when viewing the post details page. 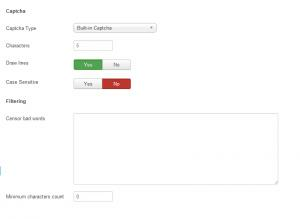 Enable captcha for reports - Yes/No; users who submit reports will have to pass captcha security. Content to Feed - you can choose the send the full text of the post or only the intro to your RSS. Add To Any - will display an Add to Any icon. 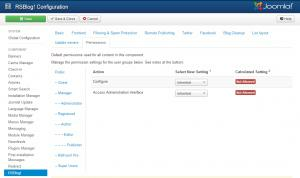 Case Sensitive - choose if the input of the captcha field will be case sensitive or not. reCAPTCHA Theme - choose the theme that best integrates with your template. Minimum characters count - Prevents posts that have a small amount of characters to be submitted. This option can be disabled by using the value: "0"
Sharing your new posts on Facebook and Twitter has never been easier, starting with Version 1.12.18 you can use the social interactions feature for remotely created post as well. 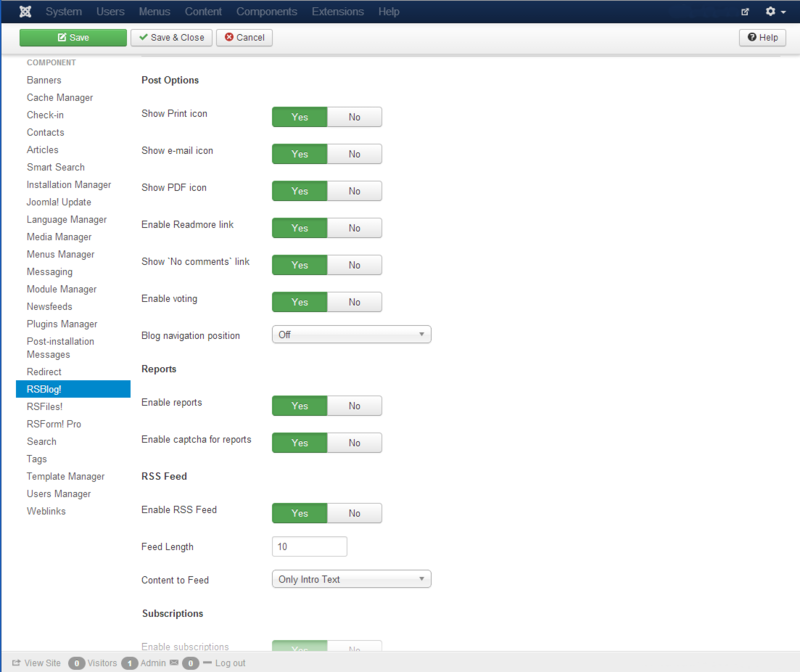 This feature allows you to create and publish blog posts, simply by sending an email to a designated email address. Default Received Category - choose the default category your remotely submitted posts will be place in. 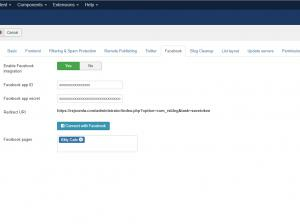 Parse attachments - if enabled, the email attachments will be uploaded into the post. Allowed extensions - set the allowed extensions for the email attachments. Separate multiple extensions by using comma. the actual picture file name has to contain [cover]. If your file is named catPicture.jpg and you want to use this as a cover, rename it to [cover]catPicture.jpg instead. Your email can have multiple attachments, besides the cover picture, other attachments will be simply parsed and added as blog post attachments. Consumer Key - This is your Twitter account's consumer key. Consumer Secret - This is your Twitter account's consumer secret key. Access Token - This is your Twitter account's access token (oauth_token). 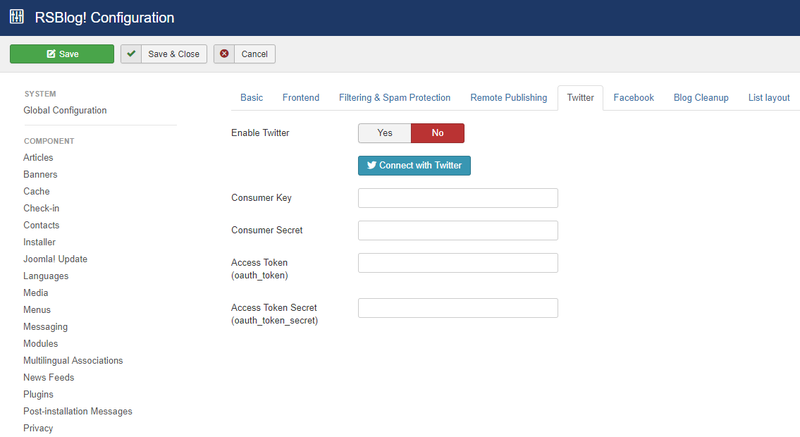 Access Token Secret - This is your Twitter account's access token secret (oauth_token_secret). 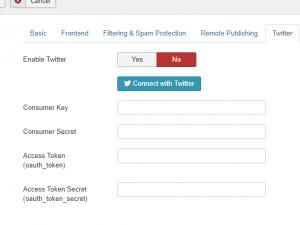 You can get all these keys from your Twitter app (if you don't have one, you'll need to create a Twitter app; for more details refer to Twitter's online documentation). 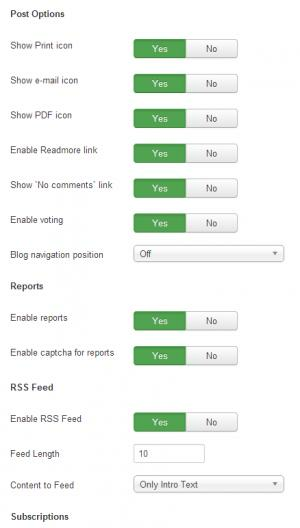 Enable Facebook integration: - Set this to Yes if you wish to post your articles to your Facebook pages. Facebook app ID: - details are provided here. Facebook app secret: - details are provided here. Connect with Facebook - Clicking this button will authorize RSBlog! on your Facebook account. Facebook Pages - you'll be able to select the Facebook pages where you want to post after you've configured your Facebook integration. 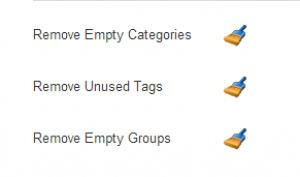 Remove Empty Groups -clicking this button will remove all groups that have no members. 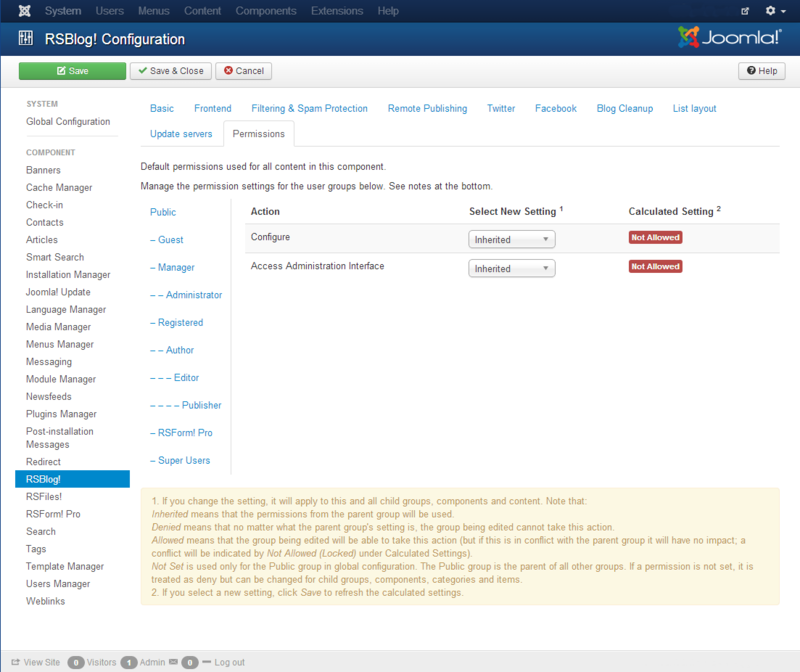 This section will allow you to select which columns you wish to display into the main, back-end Posts area, thus you can select "yes" or "no" to the following columns: Author, Hits, Comments, Created date, Modified date, Categories, Tags. 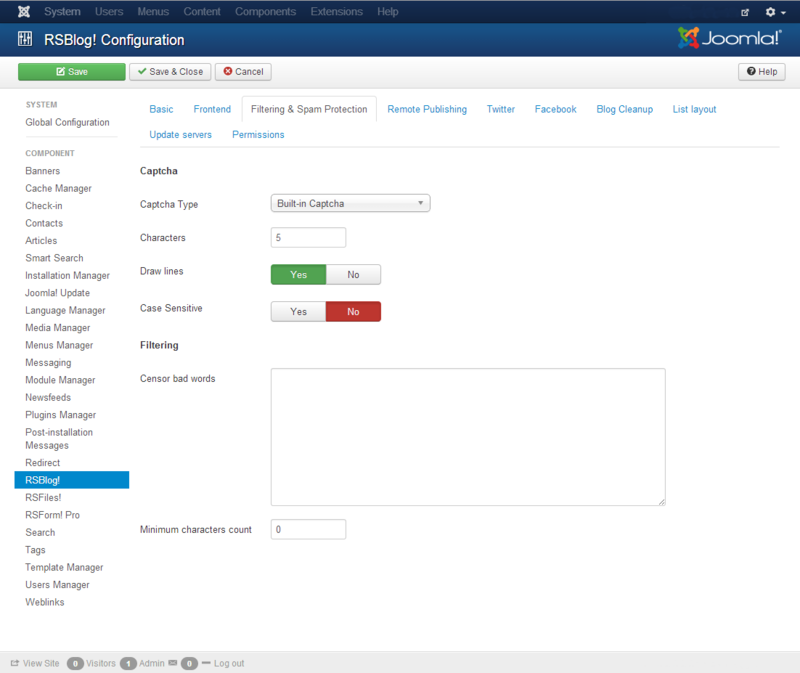 Default Joomla! ACL user group permissions used for this component. 4 persons found this article helpful.